Print large, impressive visuals from virtually anywhere. Fast Ethernet (100Base-T) capability let you use your printer in any networked environment. Comes with 32GB RAM and a 160GB hard drive. 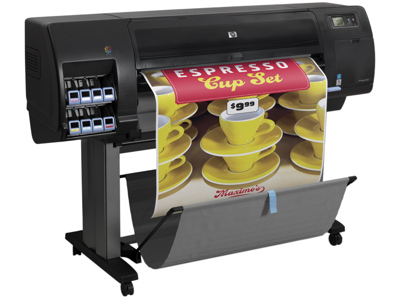 Features an auto document feeder for faster, more efficient printing. Offers a print resolution of up to 2400 x 1200 optimized dpi from 1200 x 1200 input dpi and optimization for photo paper selected. No need to make trade-offs with this, the fastest printer in its class.1 The HP DesignJet Z6200 Photo Production Printer—a workhorse in disguise—enables you to offer outstanding photo image quality. Become a trusted partner with HP technologies.